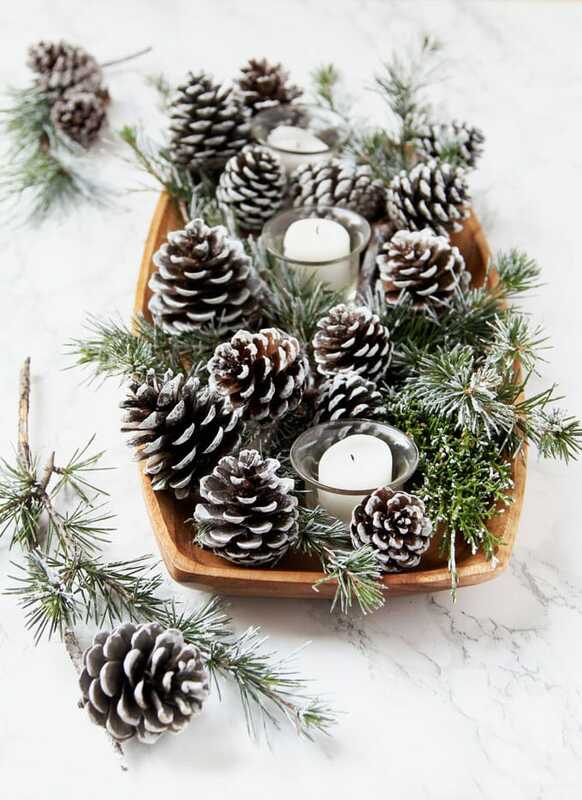 This enchanting winter and Christmas DIY table decoration reminds me of some of my favorite table top Christmas trees with snow covered branches and pine cones. Table centerpieces often require floral foam to keep everything fresh and in place. After reading about the potential harmful effects that floral foam may have on the environment and human health, I have been using other creative alternatives. I am excited to share with you a really simple and wonderful solution here. Can you guess what it is? a 28 oz recycled can, and floral foam substitute: some sand and water! Wet sand provides moisture for the fresh cuttings and works really well at holding everything in place. I used a small piece of 5 inch burlap ribbon and hemp twine or jute twine to cover the tin can. 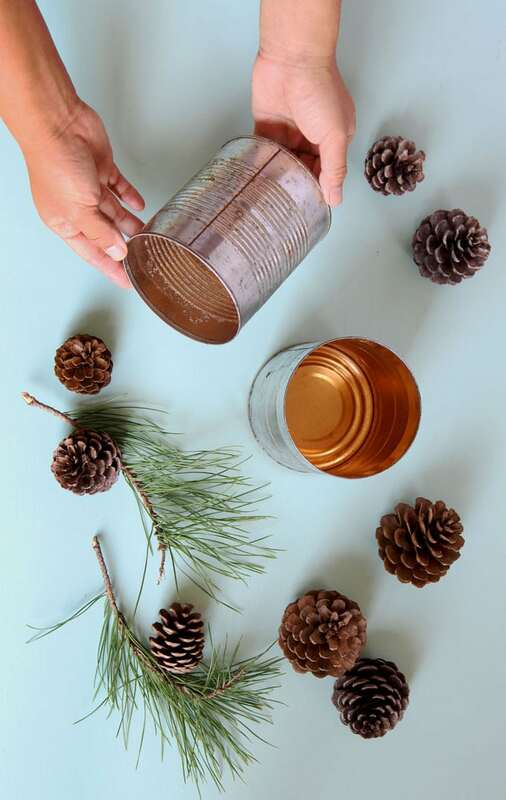 You can use any fabric or paint to transform the can at the end, or leave the metal look and just add a ribbon. 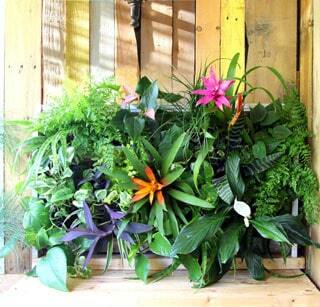 If you just want to use fresh foliage without the snow, skip to Step 2. Here’s the detailed tutorial on how to make snow covered pine cones and branches. It is so easy, you can do it in less than 5 minutes! You can use the techniques on real or artificial greens. 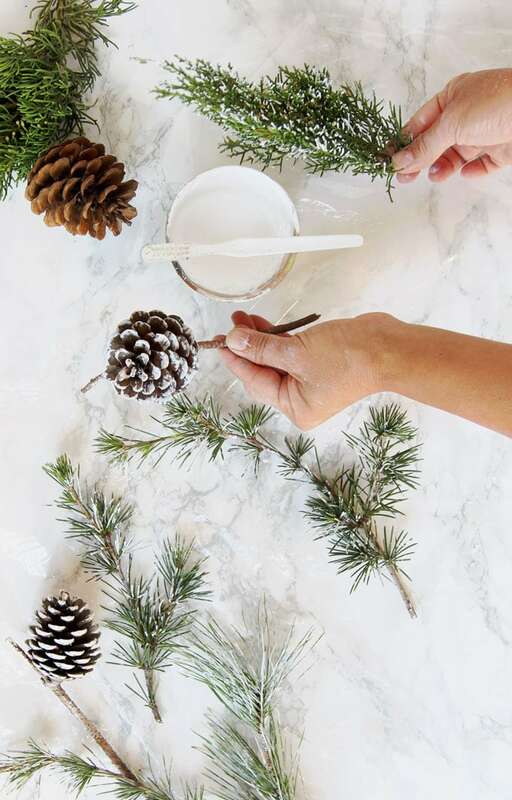 How to make snow covered pine cones and branches easily! We are using them in many decorations this year! 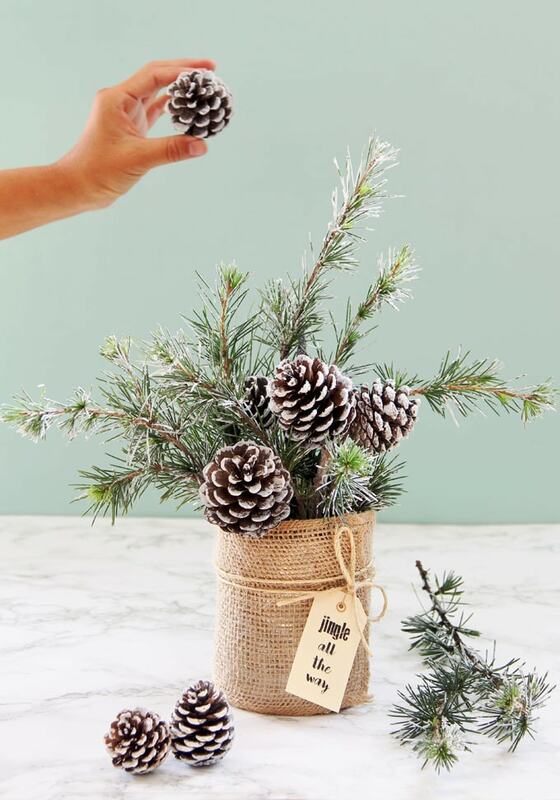 These mason jar centerpieces are decorated with these branches, tutorial here! We used a 28 oz tin can as the container. The wet sand provides moisture for the fresh cuttings and works really well at holding everything in place, like floral foam. 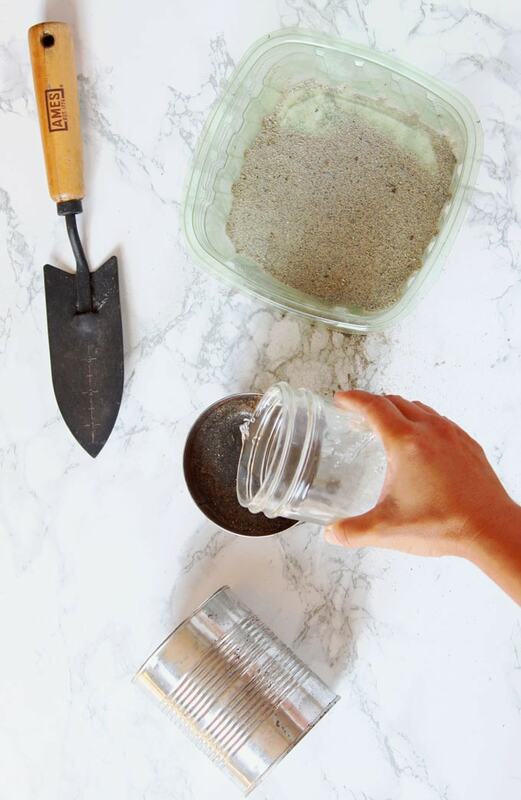 You can use just water, the sand makes it easier to arrange everything. 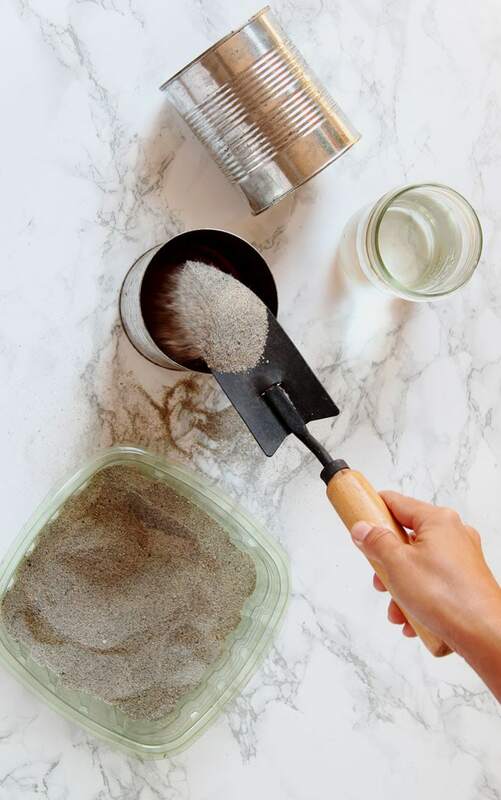 Use more sand, less water, and press the sand down to compact it. The trick here is to keep stepping back and look at the overall composition, to make sure everything looks natural and balanced. 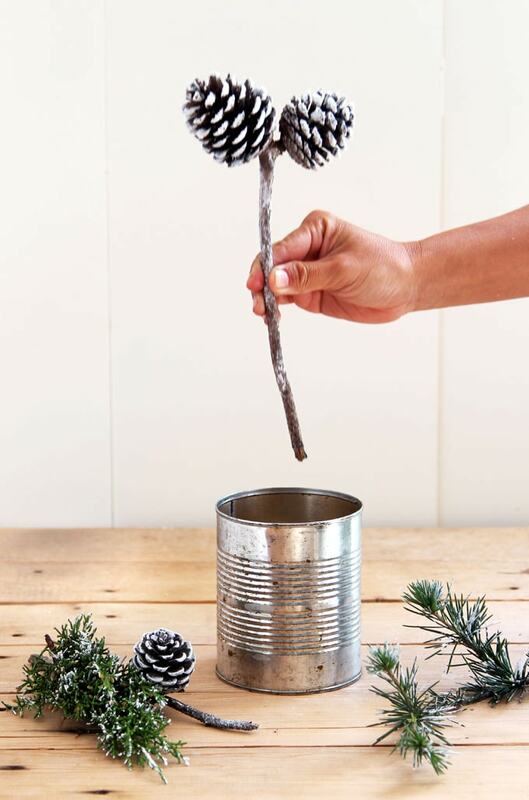 If you can not find branches with pine cones on them, you can glue a few pine cones to some branches. 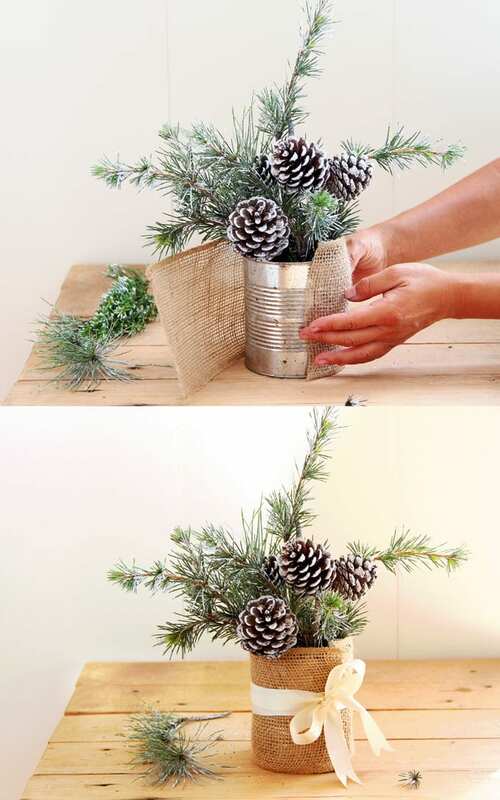 This snowy tree winter and Christmas DIY table decoration is like a mini arrangement. 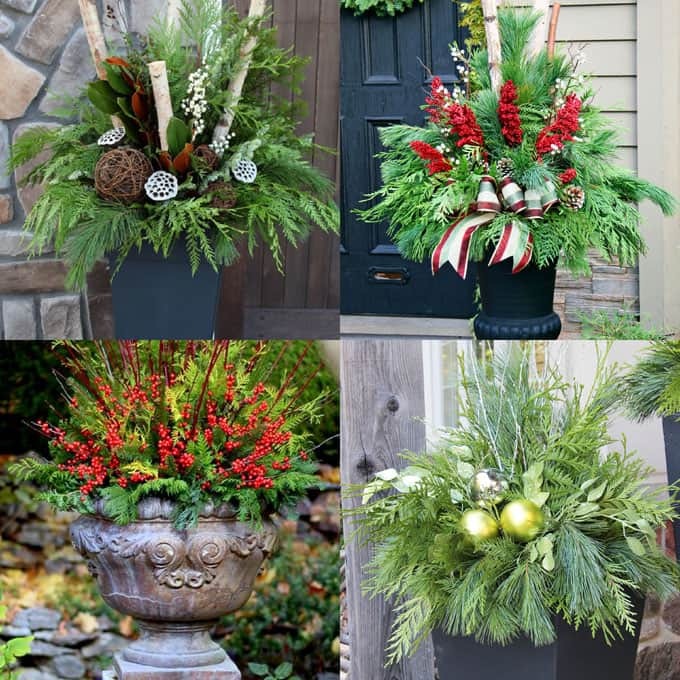 You can make it in a much larger scale for your front porch like these ones: 24 festive DIY winter and Christmas planters! Final step: dress up the can. I think tin cans are lovely as is. 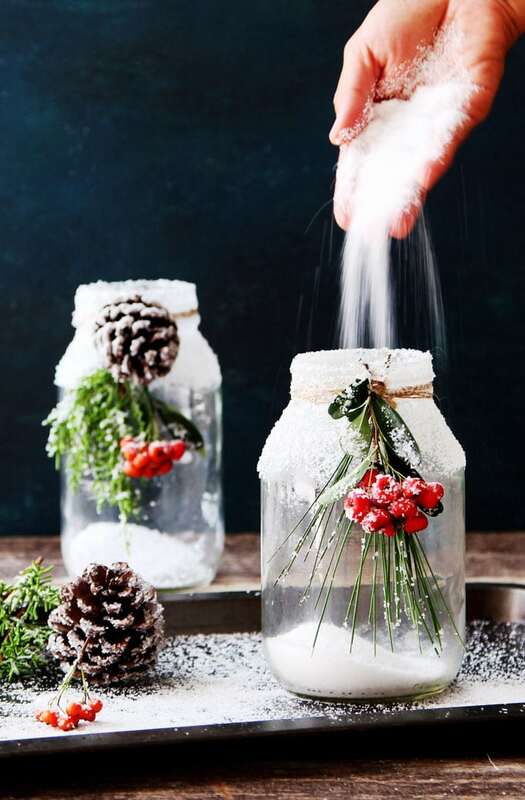 But there are so many creative ways to make this snowy tree winter and Christmas DIY table decoration centerpiece look super beautiful for decorations and gifts. Feel free to improvise! Here’s what I did. 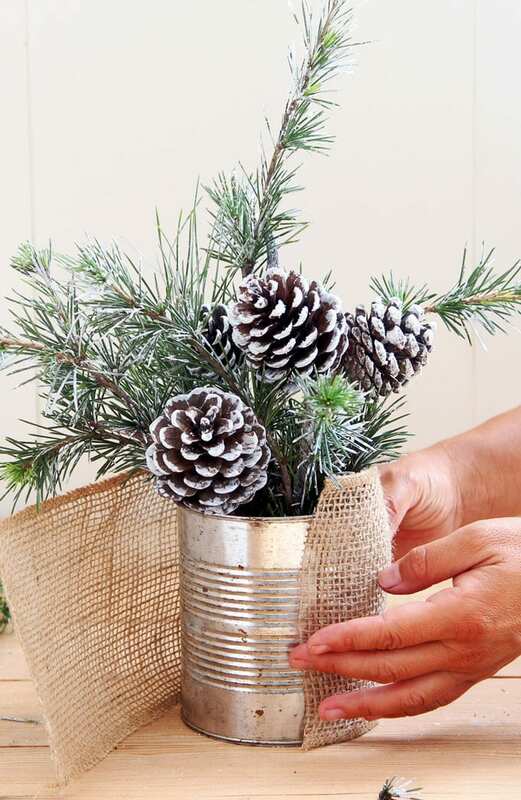 Take a piece of burlap or a section of burlap ribbon (I used 5 inch burlap ribbon like this one), tape one end to the tin can, and wrap it around the can. Use a couple of small dabs of hot glue to secure the other end. I played with some variations. The first one is with white ribbon shown above. 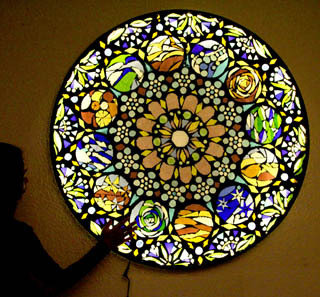 This would be very pretty as a wedding table centerpiece! The second one is with natural jute twine. Which one is your favorite? Mine is probably this one. 🙂 I love the rustic feel. 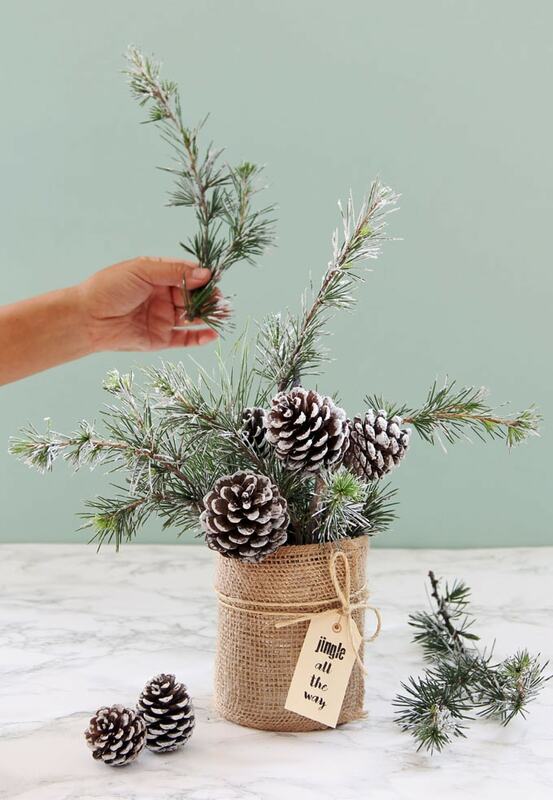 With a little gift tag, this snowy tree winter and Christmas DIY table decoration would also make a great gift for a nature lover! 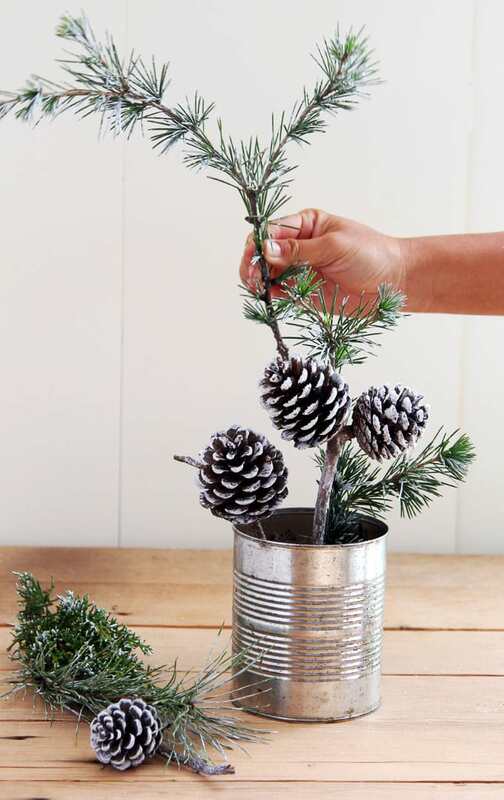 Tips: If you want to make it for Christmas gifts, artificial greens will last forever, and you will not need wet sand, just use some pebbles inside the tin can. 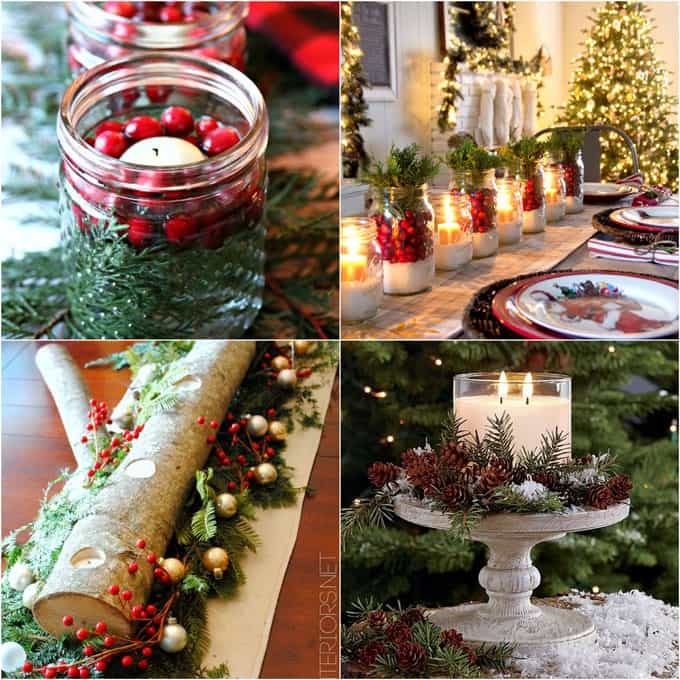 Love Thanksgiving and Christmas centerpieces? Here are 27 gorgeous ones to get inspired by! 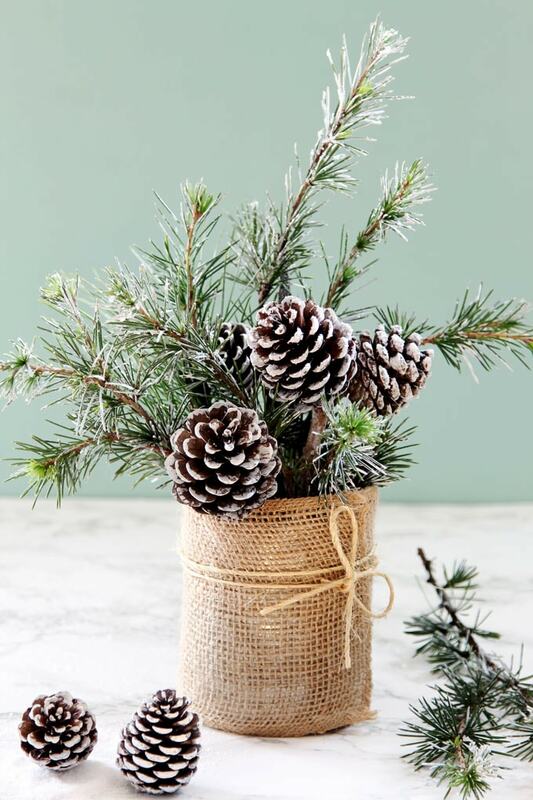 27 gorgeous DIY Thanksgiving and Christmas centerpieces! Everything came out so beautiful. 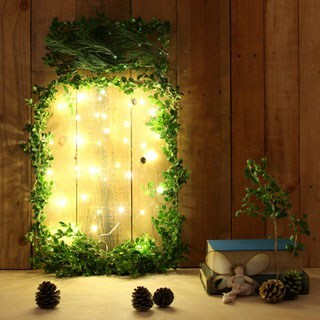 Thanks so much for sharing those wonderful DIY decorations. I just love seeing DIY projects. They’re so satisfying. This is soooo beautiful. 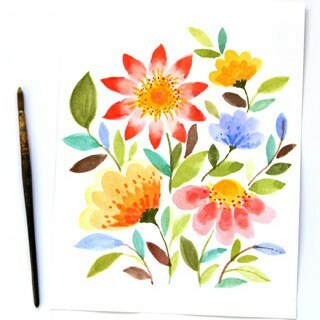 I wish I could make something as amazing as that. This is so pretty! It’s festive without being over the top. I love the rustic look.